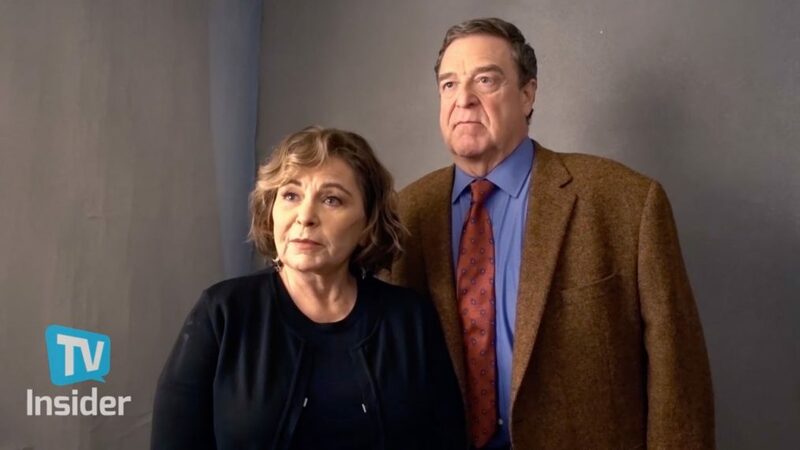 Sara Gilbert, Roseanne Barr and John Goodman in the Roseanne premiere "Twenty Years to Life." The long-awaited return of Roseanne has finally arrived! The stars also clued us in on where their characters are in the revival...but does Jackie have a job? During the conversation, they talked about the show's man nods to the original series, their hopes for future seasons, and what it meant to return to work together. Below, find five things we learned at the special event. The Roseanne reboot brings with it the addition of new child actors, as all of the original kids are grown up. Shameless's Emma Kenney, Ames McNamara, and Jayden Rey all show up as Roseanne (Barr) and Dan's (Goodman) grandchildren. During the panel, Barr and Goodman couldn't help but make faces at McNamara from the stage as he sat in the audience. Fishman also made it clear that, as the former youngster on set, it's been his mission to make sure the new kids have a good experience. The actor worked on the original 'Roseanne' from 1988-1993. In the show's original run, Roseanne always made time for stellar Halloween episodes. There won't be one this time around, but the cast promised that "relics" of Halloween past will pop up in the season. They even joked that, despite the Conners being strapped for cash, they always managed to pull off an elaborate party. This is not unlike Barr herself, who revealed she throws an annual Halloween party for the people in her Hawaiian hometown. Sarah Bernhard and Roseanne Barr in the Roseanne episode, "Halloween IV." When asked if they plan to continue the show past this season, the answer was a resounding yes. "We all want to, definitely," Barr stated. "We had such a blast. And it was just so fun to be together again ... we remember all the old jokes and all the old things that we used to do and they were so funny and still fun." "It kind of felt like it took some years off,” Barr continued. “It subtracted some years from my life. I felt young again." On-screen husband Goodman chimed in about a possible eleventh season, "If I live that long!" 'The Big Bang Theory' actor reprises his role as David. Known as one of George Clooney's first roles, Booker Brooks was Roseanne and Dan's likable employer, a character the cast would have liked to have back. "We did ask him, but he lives in Italy,” remarked Barr. “We always have our door open for George." The comedienne hasn't been shy about her support for Trump. Since the series finale in '97, fans have mourned the death of Dan Conner, so his reappearance has been nothing short of confusing. However, Barr assured everyone during the panel that it was always going to be this way. "It’s not what you think it is at all, and a lot of people have missed it,” she explained. “Since the ninth season I’ve always wanted a tenth season so, I’ve always had it in my mind how it would resume. It’s the same idea that I had a long time ago. The truth is told in the first episode with Dan and Roseanne in the garage. People think it’s in the beginning of the show, but the truth is it’s in the garage scene." While her statement is a little cryptic, the intent is clear—Dan was always going to return for Season 10, regardless of the year.